Getting into running can seem daunting, however there are so many benefits to running that can quite literally change your life. 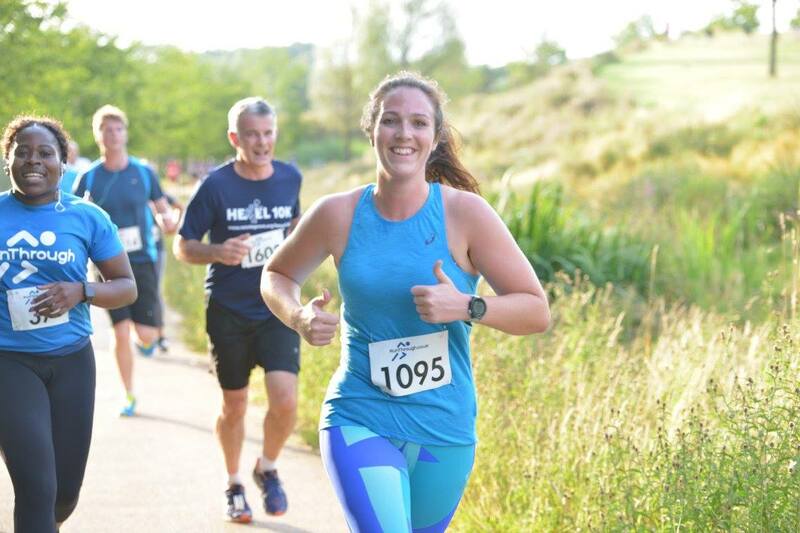 Exercise-phobe turned keen runner, Becca Burns tells us her story and gives us some tips on how to get started. I used to think people who enjoyed running were crazy. Then I became crazy about running. Growing up I spent the entirety of my teenage years overweight, I didn’t exercise, I made poor dietary choices and my health: both physically and mentally suffered. I was bullied during most of my high school years: as the chubby, frizzy haired girl with braces and a love of science I didn’t stand a chance in an all girls’ school. My 18th Birthday arrived and I was horrified by the photos, it gave me a slight incentive to join a gym and make an effort but as soon as I went to University I slipped back into old habits. I kept hiding behind excuses like ‘I’m obviously meant to be this weight/ shape’ or ‘you can’t be smart and sporty’ convincing myself that I was prioritising my studies and didn’t have time to exercise (but I certainly had a lot of time to go clubbing!). A photo taken during our last week of first year was where it all began. When I saw this photo I was mortified. 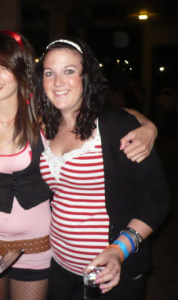 It hit me just how much weight I had gained during my initial year at University and I broke down in tears. Perhaps this photo doesn’t do justice to my size, but I was tipping the scales at over 15 stone and just about getting into size 18 dresses. Everyone is different, but for me that wasn’t a healthy weight. I was determined to do something. That’s how I initially found running. I began just gently jogging up and down the canal in Lancaster. I didn’t have a clue how far I was going or how fast but I enjoyed it. I soon began to realise that lacing up was not only improving my physical health but it was helping my concentration levels and my grades began to improve. My love of running was ignited and as my fitness improved it propelled me into so many different areas. The weight loss gave me so much confidence. I was proud of my new figure and as shallow as it may sound, putting on a size 10 dress on my 21st birthday is up there with my graduation day. I felt so proud, and it was worlds apart from the person I was when I turned 18. I went on to study for a PhD and I trained to be a Zumba instructor. I overcame all my previous excuses. I ran my first 5k race in 2012, it was a Cancer Research Race for Life, and I finished in around 26 minutes spurred on by the intention to raise as much money as I possibly could. I loved the buzz from racing but I didn’t think regular people could enter races– I thought I had to be an ‘elite’ runner. In 2014 I ran the Preston 10K my furthest ever distance, and it felt so tough! I guess the spacing of these events shows what a slow developer I was in terms of running. I just did it on and off as I fancied, it never felt a chore and I really enjoyed my runs but at the same time I never made any progress. A change in circumstances in 2016 propelled running back into my life and this time with an unrivalled passion. I had owned a horse for 12 years and losing her left a massive hole in my life, particularly on Saturday mornings which I would have usually spent at the yard. I began looking for something to fill my time and that’s how I found Parkrun. I went, I loved it and the rest is history. This year I set myself a goal of racing each month and apart from March when I had some injury setbacks I’ve achieved it. I’ve taken a whopping 5 minutes off my 5K time, just over 10 minutes off my 10K time and in June I ran my first half marathon. 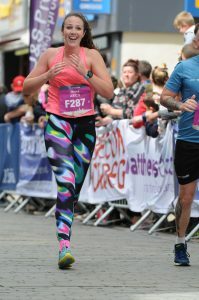 Coming across the finish line at Swansea Half Marathon was extremely emotional, if you had told that overweight 18 year old one day she would run a sub 2 hour half marathon on the first time out, she wouldn’t have believed you. In addition to all the running adventures, one particular highlight of 2017 was being selected for the ASICS UK and Ireland FrontRunner team. A diverse array of runners from all different backgrounds who share a passion for running. I’m hoping the adventure will continue and my next goal, besides improving my half marathon time at Ealing in September with the FrontRunners, is to run the London Marathon. It has always been my dream, even when I never ran, I would always watch the marathon in awe. Having recently moved to London and working in a prominent location close to the finish line it just seems more appropriate than ever. I’ve entered the ballot, so keeping everything crossed that it will be sixth time lucky! Try a parkrun: There are loads dotted around the country (and the world). Great atmosphere, beautiful parks and supportive runners and volunteers. Whether you run or walk it, it doesn’t matter. If you’re struggling with the thought of a 5K get join the couch to 5K movement, which helps break it down into manageable chunks. Find your local parkrun on their website. Book a race: There is genuinely no better motivator than having something to work towards. Step outside your comfort zone. If you’re frequently running 2K book a 5K, if you’re running 5K book a 10K and so on! Crosstrain: I find that doing other forms of physical exercise helps improve my running. I lift weights and do Zumba/ other forms of cardio 2-3 times a week. Get a running Instagram: my passion for running has largely been fuelled by my Instagram page @thisbunnyruns. I use it to share my journey as well as following other amazing runners. It’s a great motivating tool and it has helped connect me with some wonderful runners. The Instagram running community is extremely strong and there is a wealth of advice out there. Join a running club: No they aren’t for the professionals. Joining a running club will massively help your confidence and your progress as well as opening up a whole social realm surrounding running. You suddenly have 50+ runner friends! You will find all ages and abilities at running clubs, do some research and find one that fits your goals (some are more competitive, some are more social). Track your progress: whether that’s in miles, the time to do a 5K, progress photos or the number on the scales. Find a manageable way to monitor your progress and celebrate the small victories. Non scale victories are the best! (Disclaimer- running can make you gain weight as you gain muscle, it all depends on your body composition). Don’t compare yourself to others: so what if your friend runs 5K sub 25 minutes whilst you’re celebrating finishing in 37 minutes? It doesn’t matter. Your journey is YOUR journey! Trying to be someone else is a waste of the fantastic person you are! Get yourself some new gym kit: I would always recommend running in a good pair of trainers (your body will thank you) but also just some new running tights or a new top can help you feel amazing and provide that little bit of extra motivation. Enjoy it: granted you may not enjoy your first run, but stick at it and enjoy the journey, including its ups and downs.